We just released a few extra tickets for the sold out show at Parkteatret tonight. All set for Neu-Ülm and Deutzen this weekend. Last rehearsal tonight. Parkteatret in Oslo next Friday is announced sold out. Dan is checking out. Will be a passionate one. Might be a few tickets at the door. Let you know. See you all soon! Loyalty to the end! Dan leaving - A black celebration at Parkteatret on Sept 14. What follows is an official message from Dan Heide. Guitargenius of ZMR since 2003. He will of course go out in fashion. ZMR is playing three shows in September, whereas Parkteatret in Oslo will be his final. We will do nothing but celebrate that. A very special night. A black celebration of course! I am leaving the band. But I am not leaving the boys. When I first started out in ZMR 15 years ago, it was a dream come true. I was 21 at the time and I felt ready to capture the world. Why leave one of the best bands on the planet you might say? Well, I have asked myself that question over and over again. In the last period of time I felt strongly the need to do a little change in life, in order to give myself som space. For myself, for my family and for my creativity. I will not stop with writing music and playing guitar. I just needed to do some priorities. And if you want something to sound as good as ZMR does at it’s best you gotta give 100%. And I can’t give that right now. My decision is not due to any disagreement or anything like that. I love the boys, and the boys love me. So, a big big thanks to all our faithful fans here and there!!! From time to time we see people travelling from different countries, and sometimes different parts of the world to witness our show. It really means a lot! So again, to each and everyone of you: Thank you so much!!! ZMR is a big a part of me, and I think it will stay that way. ZMR show in Norway September 14. Zeromancer has long wanted to play at the iconic, Parkteatret in Oslo. On September 14th 2018, it’s finally happening. ZMR returns with an exclusive concert in their home country. Get your tickets! New material is in the making. The single, ”Damned le Monde” will be released before the summer. Newalbum is awaited next year. ZMR and Seigmen @ WGT! Zeromancer will return to Agra in Leipzig during the mighty Wave Gotik Treffen this year. The definite date is still to be defined. However the festival is held between May 18 -21. It sure is a once in a lifetime event since Seigmen will appear at the same festival. Two skulls. One soul. 08.09 Volle Kraft Voraus festival in Neu-Ulm (DE) ZYA! Total was off the hook. What a great way to say goodbye. Thank you everyone for making this so special. And so warm. Lorry's brother surprised everyone by proposing from stage. Crazy. Big bro in tears. Invited Per Olav from Untime on stage for Photographic encore. All hands in the air. Insane. Best funeral ever! So sorry about this. This immense alternative festival in Kettering, UK has been cancelled just two weeks prior to the event. We know for a fact that even Norwegian fans have bought tickets for this. It breaks our heart. It's a real tragedy. Read more about why from the promoters on the Alt-Fest offical site. AMPHI...what a delightful success. Such a blast seeing so many people coming up every time we do a festival show in Germany. Insane! Now, Total is next. A shame closing down a spectacular place like that. However, we have to finish up what we started off. It's gonna be an unforgettable Saturday evening. Hope to see you guys. Up close! Wanna thank you all for coming to see ZMR at these Best-of-shows in Germany. Many of you showed up on several occasions. It's been an overwhelming and fantastic experience. Deeply appreciate the dedication. We we gave it all. You did too. A bond so beautiful. Now we all have to wait for next summer. Stay underground! Three shows down...and what an amazing run we've had so far! Frankfurt, Duisburg and Leipzig. Last night at the Anker in Leipzig was a classic. Can't even begin to tell you how grateful we are for having such devoted fans. Back in Norway now looking forward to the last ones in Hanover and Berlin. The best-of-sets have been a blast. Almost a shame it's just these five exclusive German gigs. Sending a big hello to our tourbuds, Dreadful Shadows and Army of the Universe and our beloved crew. See you soon everyone! Last rehearsal tonight! Best-of shows starting on Wednesday in Frankfurt. Get your tickets! Miss you guys. See you soon! Finally we can announce that Zeromancer will play at Støperiet in Tønsberg during the Slottsfjellfestival. It will take place on Friday July 19! Showtime around midnight! Get your tickets Manceros. Let's share another special one! Two sets of dark weekends coming up this fall. We are proud to announce 4 exclusive co-headlining shows together with our friends, Dreadful shadows. Hulen in Bergen and Folken in Stavanger coming up. The last two shows on the "Tortured Artist Tour" Two great venues in the ZMR history. What a finale it will be. So looking forward to this weekend. Extra rehearsal tonight. It looks like it might be the very last time we come visiting Bergen and Stavanger with ZMR. Let's gather up people. Let's make this a weekend to remember! Tønsberg and Total tomorrow. Been there this evening preparing. It's gonna be a good one. Few tickets left...so if you are still debating going or not.... Take action now. Get your tix asap! Opened at Szene in Vienna last night with a great show. The red bus now parked outside Frankfurt in the town of Rüsselsheim by the venue, Das Rind. Having a blast on tour along with our friends in Scream Silence and Eyes Shut Tight. BYE-BYE BORDERLINE LP FOR SALE! Early birds! This Monday morning thegarden.no start selling the Bye-Bye Borderline LP. Remember they are very limited. Only 100 white vinyl. 300 black vinyl. So..true Mancers, get your copies asap! In two weeks the Tortured Artist Tour kicks off in Vienna. It might be the last one. We really don't know. However we will make our priorities a little different after this tour. Too many obstacles and tasks in life is calling on us. From this day on, Zeromancer will be more exclusive. You shouldn't worry. We have more releases coming. 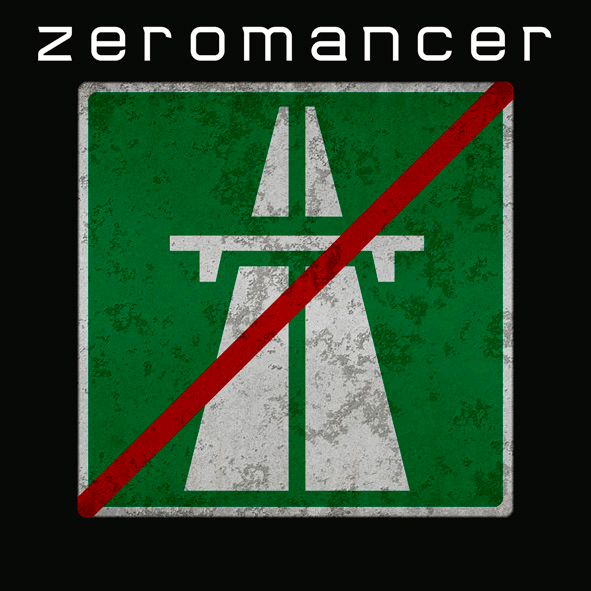 Though if you wanna catch Zeromancer on tour, now is the time!!! No hesitation. Spread the word everyone! Love you all. See you soon! Celebrating the number one spot on the European Alternative Chart for the fourth week in a row. Our Russian fans are amongst our most dedicated. Now we are extremely happy to announce that we are back with IronD records and releasing Bye-Bye Borderline in Russia. Like with our other releases the cover will have another look. This time the negative of the original. White cross on black! More news to come regarding releasedate!